Indeed, Boyle Heights founder William H. Workman took an active interest in improving the growing city's parklands while mayor of Los Angeles in 1887-88, during which time a new city charter was drafted and a parks department and commission were created. 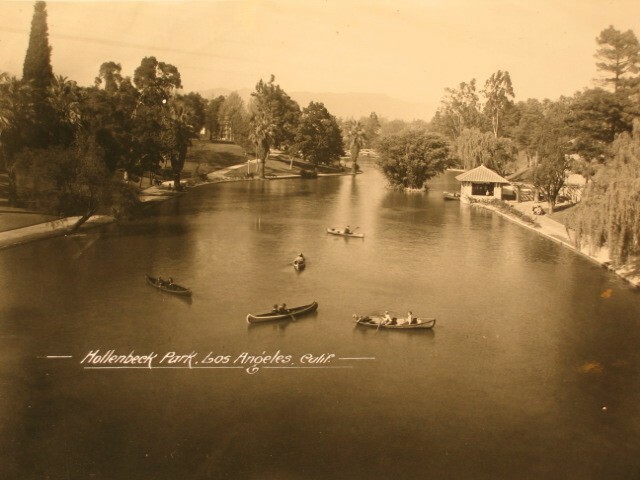 In the 1890s, Workman was a member and chair of the parks commission and, during that tenure, Hollenbeck Park was added to the system of city parks (a few later, at the end of 1896, came the massive 3,000-acre Griffith Park.) In fact, Workman donated two-thirds of the property, with the remainder coming from Elizabeth Hatsfeldt Hollenbeck, and the two gave this gift to the city in honor of Mrs. Hollenbeck's husband, John. In the space of a decade (1875-1885), John Hollenbeck, a native of Ohio and raised in Illinois who came with his German-born wife to Los Angeles after many years in Nicaragua, became an influential and well-known figure in the city, amassing a broad portfolio in banking and real estate. He was president of the Commercial Bank of Los Angeles and a founder of the First National Bank of Los Angeles. His real estate empire included 3,500 acres of Rancho La Puente in modern Covina and West Covina in the eastern San Gabriel Valley, a prominent hotel and business block in downtown Los Angeles, and his home and estate in Boyle Heights. In 1880, Hollenbeck worked with former California governor John G. Downey, nurseryman Ozro W. Childs and others to convince the state to buy a section (or 160 acres) of land southwest of downtown, which had been used as an agricultural exposition grounds and was known then as Agricultural Park. Later, the site became Exposition Park. Because of health problems stemming from his years in tropical Central America, Hollenbeck died in his fifties in 1885. 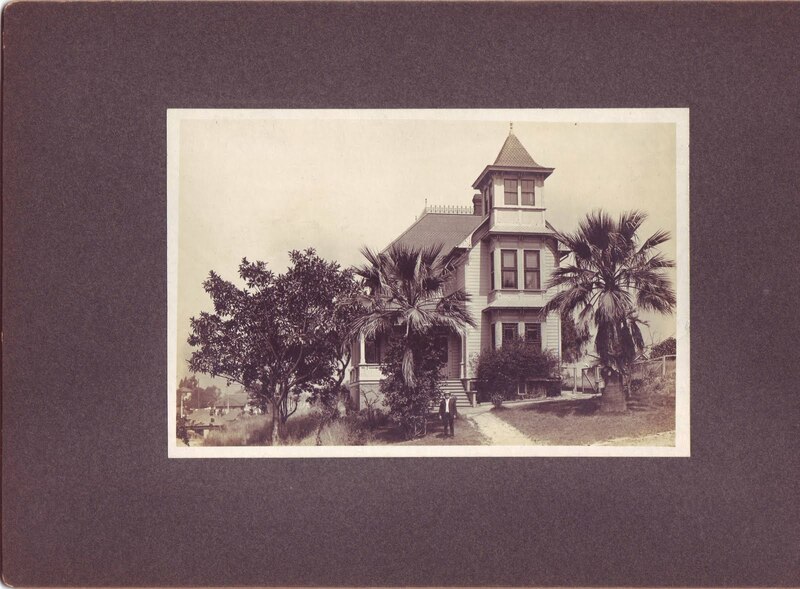 In addition to donating some land for the park, Elizabeth Hollenbeck willed the couple's home and surrounding grounds across Boyle Avenue for a senior citizens' home, dedicated in 1896 and now known as Hollenbeck Palms. After her death in 1918, Mrs. Hollenbeck was interred with her husband at Evergreen Cemetery at the east end of Boyle Heights. The above photo, from the Homestead Museum Collection, was taken during the 1920s and seems to have been shot from the landmark wooden bridge that spanned the park at 6th Street and which was, in 1968, dedicated a Los Angeles city historic landmark and then promptly destroyed. Much of the lake is captured as well as five canoes and a boathouse on the shoreline at the right. Beautiful trees of several varieties lined the lake and, far to the north, are the faint outlines of mountains (perhaps the Verdugos above Glendale or the San Gabriels.) As with all photos posted on this blog, clicking on the image provides a larger view. One of the more controversial results of the post-World War II transformation of the city was the massive and program of freeway construction that, in Boyle Heights, bore through large sections of the working class neighborhood. The Interstate 5/Interstate 10 corridor was built right over the southern portion of the park and lake and much has been said and written about the consequences of this work in an area that has been economically and politically disadvantaged. This result is readily observed at Hollenbeck Park today, although the Boyle Heights community continues to use and support its park in its own way much as their forebears did in preceding decades. Contribution by Paul R. Spitzzeri, Collections Manager, Workman and Temple Family Homestead Museum, City of Industry. Hello Freddy and Johnny, thanks for your comment. More historic photos of Hollenbeck Park are to come, so check back in with us. Thanks!